Whenever I play a T. Rex song, I get sucked into Marc Bolan’s shiny little world filled with unicorns and wizards, Cadillacs and glitter, and I refuse to leave for months. No other music is important for a while, and no other world feels more like home. Marc had a halo – a shining light that he emitted which followed him everywhere. Some say he was self-absorbed and pompous but they are just jealous. He disappeared so suddenly, a cruel death at the height of his beauty at age 29 in 1977 (Marc and Elvis Presley died within a month of each other) at the onslaught of Punk Rock which he embraced, and whose denizens worshipped him. Marc colored our dreary lives, along with his dear friend David Bowie. Although they are both now departed, they have never really left us in spirit, nor in song. 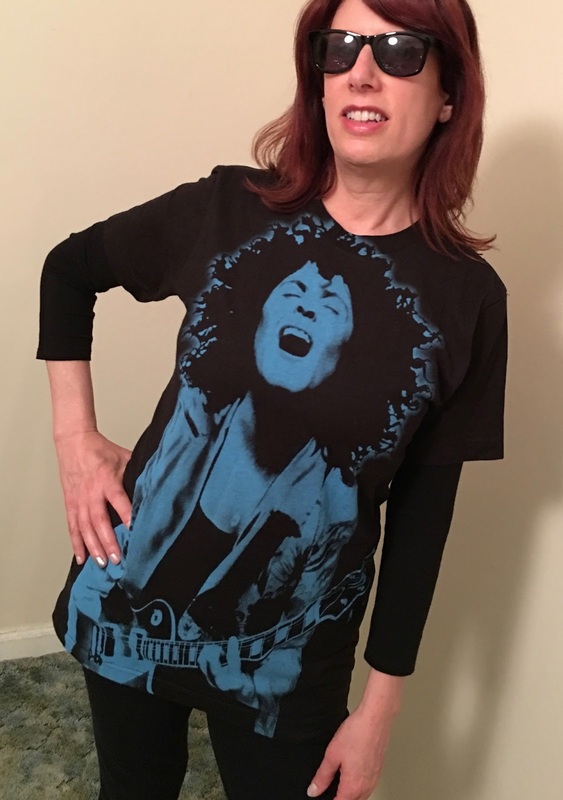 40 years after Marc’s passing, and on his 70th birthday, New York City celebrated Bolan’s life and the music of T. Rex and Tyrannosaurus Rex. Light all the fires – it’s the king, and he’s coming home! Hostesses applied glitter to our cheeks. Manic Panic supplied free iridescent nail polish. 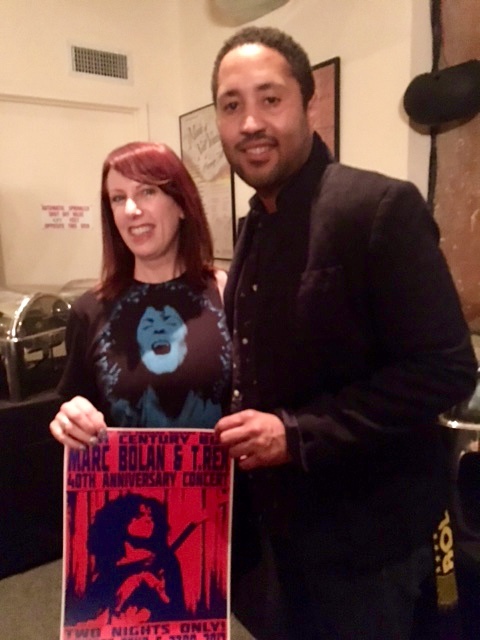 A merchandise table raised funds for the Marc Bolan School of Music in Sierra Leone, run by his partner Gloria Jones. Their son Rolan Bolan performed two of his dad’s songs. This is one of the annual events hosted & curated by singer-songwriters Joe Hurley and Edward Rogers. The previous NYC tribute was in Central Park in 2007. These magical shows feature a cavalcade of T. Rex lovers; from Broadway stars to legendary songwriters to R&R Hall of Famers to NYC icons who travel from all corners of the world to participate. The show featured Blondie’s Clem Burke on drums – all night long! It doesn’t get any better than that! Our bassist was Tony Shanahan (Patti Smith), on guitar Steve Conte (NY Dolls), backup singers Tish & Snooky of the hair/makeup brand Manic Panic and creators of Crazy Color hair products. (My favorite shades in the 70s were the purples – Aubergine and Cyclamen!) There was percussion and a string section of violin and cello. Also, the gigantic shiny skronking sax of Geoff Blythe (Dexys/Elvis Costello), AND a real treat – original Electric Warrior sax player Ian McDonald on ‘Get It On’!!! Ian’s sax had a dull patina illustrating its legendary status! The singers were well matched to Bolan’s songs. The evening began with Screaming Orphans’ gorgeous choral version of ‘Children of Rarn’. Suzanne Vega portrayed ‘Life’s A Gas’ as both a happy song and a sad one, as it is really both. Ivan Julian’s ‘Ballrooms of Mars’ blew us away – his soloing was the best of the night! Marc’s son Rolan shone on ‘Cosmic Dancer’ and on ‘Chrome Sitar’! The femme fatales of Bolan’s songs were represented, the legendary ‘Debora’, and John’s Children’s ‘Desdemona’. Joe Hurley and Ed Rogers kept everyone abreast of each song’s history and told amusing anecdotes between acts. The fabulous Daphne Guinness (with Malcolm Doherty (Holy Holy) performed a rousing ‘Rabbit Fighter’! Ellen Foley’s (Meatloaf) powerful vocals graced ‘Solid Gold Easy Action’. The Alice Cooper Group’s Dennis Dunaway rocked out ‘Rock On’ on both bass and vocals. A teen called Automatic Shoes did a beautiful acoustic ‘Planet Queen’. He was discovered via his several ethereal Marc covers on YouTube and flew in from Spokane, Washington. More of Bolan’s masterpieces performed were; ‘Girl’, ‘By the Light of a Magical Moon’, ‘Rip Off’, ‘Jeepster’, ‘Ride a White Swan’, ‘Metal Guru’, ‘Rapids’, ‘London Boys’, ‘Children of the Revolution’, ’20th Century Boy’ and ‘Buick Mackane’. I sobbed during ‘The Slider’ (‘cos when I’m sad, I slide) but everyone else carried on having a good time. The almost 3-hour long concert ended with the entire cast onstage jamming ‘Hot Love’. Then everyone jammed further at the Roxy Hotel after midnight, and we were all invited. I still haven’t washed the glitter off my face! And they’re doing it all again tonight! 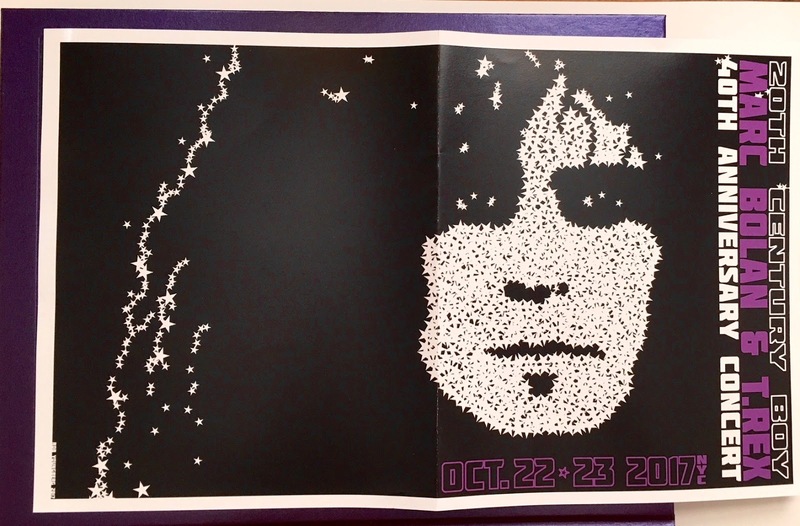 This was the best Bolan tribute I’ve attended since the one in Central Park in 2007 (featuring Tony Visconti, Patti Smith, Moby, NY Dolls & Scissor Sisters) at the Delacorte theater – the lovely outdoor venue where Shakespearean events are often held. I could almost see Marc in the window of the uppermost turret of B, glancing down with a wink. When I get to heaven, I’m going to visit Marc’s castle. I’ll bring along John Lennon to sing ‘Spaceball Ricochet’, Johnny Thunders on ‘Baby Strange’, Mick Ronson can sprinkle his angel dust on the ‘Monolith’ solo, and the Ramones can rock out ‘Debora’. I don’t know if this is Marc’s idea of heaven, but it most certainly is mine! I'm practically in tears (of joy and wistfulness) just reading this review!!! Thanxx,Madeline!